What is the right way to structure a team working remotely – all as partners? With five equity partners in five different countries, Roland and Mike discuss the challenges and benefits for how things have been going for almost the past year with the company setup. But there are some opposing viewpoints on how it should continue, and the team is internally discussing that. Listen in as we keep it as genuine as possible, as soon as it is coming out. We are still talking internally and would love to hear your input. The moka pot has been growing in sales, ranking 40 in Amazon for moka pot, still a ways to go but step by step. 1 CEO Boss or Multiple Department Heads? 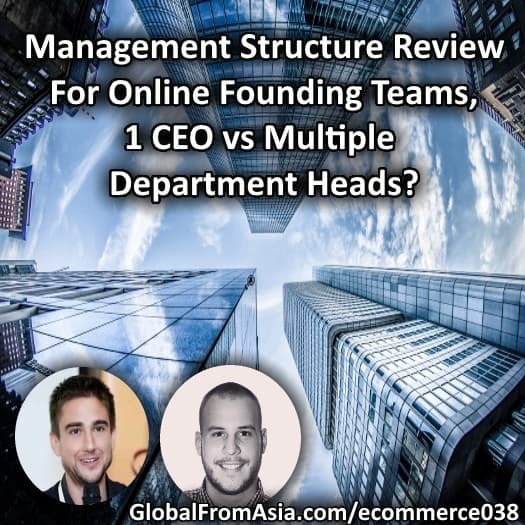 We discuss what is a better arrangement 1 person in charge of everything and knowing everything, or independently run departments by different founders independent of other departments? We discuss. Yes, the team has some different opinions about this topic but we are still operating fine. Everyone is staying professional and we are keeping this a business conversation. The team is really feeling pressure to sell this stock so that we can make another order before the Christmas holiday rush. So there you go – we are keeping it as real as we can here at the Ecommerce Gladiator Series of Global From Asia podcast. Like Roland says on the show – many podcasts and blogs only talk about the good – we are keeping things raw here. Will keep you posted what the founders decide and hope you have some ideas to share too, take care!